It was one of those days when you really want to find a good omen. The fires in Santa Rosa and Napa are devastating and I’d just heard that they’ve confirmed nine deaths. It sometimes feels like at every turn, there’s another disaster needing an outpouring of love and aide. So you can imagine how my hope sprang up a little bit when I saw this guy on the hood of my car. Praying Mantises are supposed to be good luck. Timing is everything. I was heading to the store and I figured the second I started up my car, this little guy would leap to find a better food source. But as I drove, he clung to the hood. I wondered if he was out for a joy ride? You have to zoom in to the lower left hand side of the picture (taken with my iPhone) to see him crouching on the corner of the hood. Notice how big he is! After my brief shopping trip, I was surprised to find him STILL on my car. Now I started to worry that there might be something wrong with him. Maybe he was just a maverick praying mantis, but maybe — and more likely — he was injured or sick. When I got home, I didn’t feel it was right to leave him on the car. 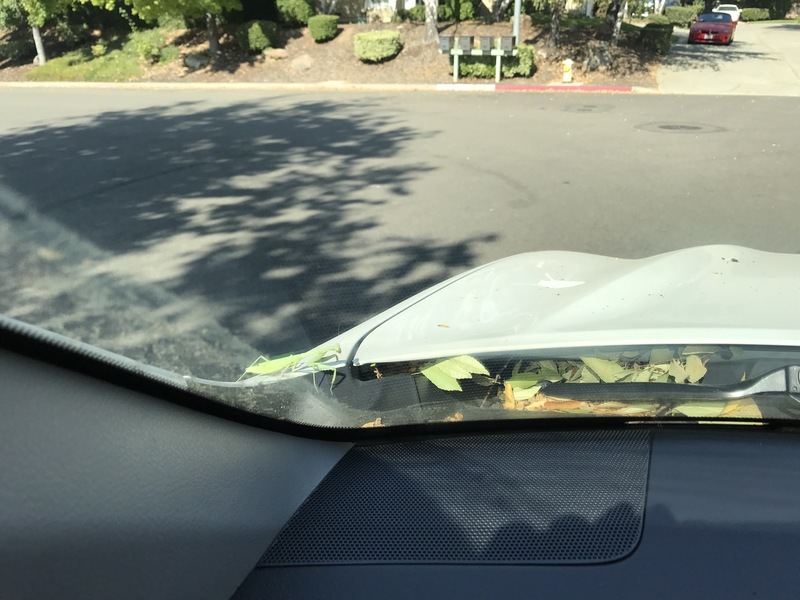 I was hopeful that if he found some bugs to chew on, he’d feel much better, so I carefully moved him with a branch over to a low, variegated plant where I thought he might camouflage himself better than on my white car. But tonight, after dinner, I checked on my praying friend and he is gone. I’m hopeful that he found a feast within those branches. PS. To you ornithologists out there, please don’t tell me what good eyes birds have, or what amazing hunters they are . . . Reality is so overrated. I really need my praying mantis to be out there praying, ok?